Coverage: Live on BBC TV, BBC Red Button, Connected TVs and online. 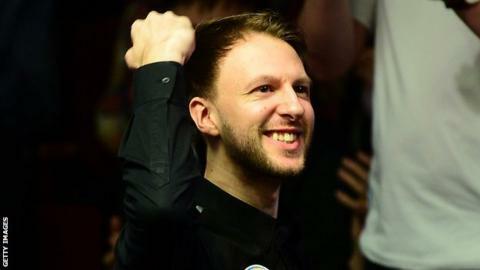 Favourite Judd Trump says he believes he is "the best" in the world and can win the 40th World Snooker Championship to be held at the Crucible Theatre. Trump, 27, has been the form player this season, reaching five ranking title finals and winning two - the European Masters and Players Championship. "I honestly believe I can play to a standard which is very rare nowadays," Trump told BBC Sport. The event starts on Saturday at 10:00 BST and runs until 1 May. Defending champion Mark Selby opens play against Ireland's Fergal O'Brien in Saturday's morning session, before five-time winner Ronnie O'Sullivan plays Crucible debutant Gary Wilson in the afternoon session at 14:30. Bristol-born Trump, who begins against qualifier Rory McLeod on Tuesday, was runner-up to John Higgins in 2011, but has only reached two semi-finals since. However, he feels the consistency he has shown this season - taking his career ranking victories to seven - puts him among the players to beat in Sheffield. "Being the favourite is a help," said Trump. "When people tip you, a lot put themselves under pressure but I use it as an advantage. "The public are seeing something from me which they have not seen before, and I think I can win it. It is about keeping your foot on the gas. "I have been too inconsistent here in the past but I am at an age where there are no more excuses, I am getting towards the peak of my career and now is the time to really step up and win a lot of titles." The World Championship will be played at the iconic Sheffield venue until 2027 at least after a new 10-year agreement was struck. World Snooker chairman Barry Hearn signed the deal on Friday during the broadcast of 40 Years of the Crucible on the BBC Red Button. Defending champion Selby won the title for a second time by beating Ding Junhui in last year's final. The Leicester man won the most recent ranking event - the China Open - but is aware that no player has won the World Championship in the same year. "The hoodoo needs to be broken at some point. Hopefully this year might be the case," Selby told BBC Sport. "To win it again and be on three just on your own would be very, very special. This year is as hard as it has been to pick a winner with so many players on form. "It is Judd Trump's best chance to win it this year." Selby plays his first match on the opening morning against O'Brien, who claimed the longest frame in professional snooker history in his final qualifier which lasted two hours, three minutes and 41 seconds. World Snooker chairman Barry Hearn said last week that China will become the sport's superpower within the next decade. This year's tournament in Sheffield sees five Chinese players competing - last year's finalist Ding, Liang Wenbo and Xiao Guodong as well as teenage debutants Zhou Yeulong, 19, and 17-year-old Yan Bingtao. Yan becomes the first player born after 2000 to appear at the main stages of the tournament and the second youngest ever to do so. But the youthful duo are no strangers to success after their two-man team won the 2015 World Cup in their home country. Englishmen Wilson and David Grace (both 31), plus Thailand's Noppon Saengkham, 24, will also appear at the Crucible for the first time. Wilson faces a tough draw against five-time champion O'Sullivan, Grace plays Kyren Wilson and Saengkham faces 2010 champion Neil Robertson of Australia. For the first time, the World Championship will be broadcast live on World Snooker's Facebook page across 40 countries in North America, South America and Asia. Tournament organisers estimate a worldwide audience of over 300 million. The total prize money is £1.75m, with the winner picking up £375,000. Eighty-six centuries were made in both 2015 and 2016 - a record.